Tracing Your Roots: Is Gunfighter Doc Holliday My Ancestor? Legend has it that the Old West gambler learned his card skills from an uncle’s black servant girl, intriguing a reader whose ancestor shared Doc’s name. I’m writing you in reference to John Henry Holliday, better known as “Doc Holliday,” one of the gunfighters who survived the shootout at the O.K. Corral in 1881. I was told by family members that he is my great-great-grandfather. My great-grandfather’s name is John Henry Holiday (sometimes spelled Holliday, as my family now does consistently). He was described as being “mulatto” and was born in 1870 and died in 1937. Like Doc Holliday, he was a native of Georgia, with my great-grandfather’s last known location being Pelham, Ga. He was married to Rebecca Riles (1873-1959), also mulatto. Together they had 10 children. I have only been able to find records on my great-grandfather when he was married, but not as a child or teen. In my search, I ran across an account of a mulatto slave named Sophie Walton who lived with Doc’s uncle Dr. John Stiles Holliday. According to a book I found called Doc Holliday, A Family Portrait, written by Karen Holliday Tanner, Doc resided with Stiles Holliday after graduating from the Pennsylvania College of Dental Surgery. We thought that maybe Walton may have borne children by Doc, since they were very close. John Henry “Doc” Holliday was a notorious gambler and gunman in the American West and gained fame for his participation in the O.K. Corral gunfight in Tombstone, Ariz. He was an icon of the American West, and much of his life has been documented. Of course, it’s best not to jump to conclusions when family lore connects your family tree to someone famous. You are right to learn what you can about Doc Holliday; the next step is to follow the paper trail of your known ancestors to try to establish a connection. Did Doc’s Time in Georgia Include Racial Conflict? According to an article in the New Georgia Encyclopedia about Doc Holliday, he was a native of Georgia born Aug. 14, 1851, in Griffin, Spalding County, to Alice Jane McKey and Henry Burrough Holliday. His uncle John Stiles Holliday built a house in 1855 in Fayette County, Ga. It is currently a museum. The article claims that the family moved to Bemiss, Ga., in 1864, and in 1866, after Doc Holliday’s mother passed away, his father was remarried to Rachel Martin and they moved again to Valdosta, Ga., where Doc attended the Valdosta Institute. He attended the Pennsylvania College of Dental Surgery from 1870 to 1872 and returned to Georgia, where he stayed only for a year before moving to Dallas in 1873. An incident that allegedly happened during that final year in Georgia may bring context to his relationships with African Americans. Around 1872, Doc and his friends decided to build a swimming hole on a piece of land along the Withlacoochee River that his uncles Thomas S. McKey and William Harrison McKey had purchased. One day Doc and his friends rode out to the swimming hole and discovered a group of black youths in it. There are varying accounts of happened next, largely based on oral history. According to accounts in historian Gary A. Roberts’ biography Doc Holliday: The Life and Legend, Doc killed one or more of the youths after they refused to leave, and fled to Dallas to avoid retribution (at odds with the popular explanation that he moved for a kinder climate to his tuberculosis). Regardless of which version is closer to the truth, if the altercation took place, it’s clear that he was willing to resort to violence specifically to keep African Americans in their expected (and separate) place. It’s also important for you to examine the time frames of these accounts carefully because they suggest that Doc Holliday was in and out of Georgia within the time frame that your great-grandfather John Henry Holliday was born. You can trace John Henry “Doc” Holliday’s movements through census records. The first census to record Doc Holliday was in 1860, when he was an 8-year-old boy residing in the household of his parents, Henry B. Holliday and Alice J., in Spalding, Ga. In 1870, John Henry Holliday, age 18, was recorded in the household of his father, Henry B. Holliday, and his stepmother, Rachel, in Valdosta, Lowndes, Ga. By 1880 he was residing in Prescott, Yavapai, Ariz.
Could a Cardsharp Servant Girl Be the Link? You suggested that perhaps Doc Holliday had a relationship with Sophie Walton, a servant in John Stiles Holliday’s home. The mention of Sophie Walton in Karen Holliday Tanner’s book, Doc Holliday: A Family Portrait, is based on a manuscript collection “Recollections of Sophie Walton, 1930-32, as told to Carl Birger Olson.” It alleges that Walton, herself a child, taught the Holliday children, including Doc, how to play cards. As Roberts notes in his footnotes for Doc Holliday: The Life and Legend, some of the claims in these recollections are questionable, based on the age of Walton and the fact that she does not appear in the household of John Stiles Holliday in 1870. Our own search for Sophie Walton in the 1870 U.S. census returned only two individuals matching her description living in Georgia, and neither is in close proximity to the John Stiles Holliday household. This means that either the census taker neglected to record her in the John Stiles Holliday household in 1870 (though that seems unlikely, given that other servants were included in the record), or parts of this recollection are not completely accurate. Putting aside Sophie Walton for a moment, if you believe that your John Henry Holliday was the son of Doc Holliday from a relationship with a black woman, then consider other avenues of research, too. For instance, Henry B. Holliday, John Henry “Doc” Holliday’s father, owned six slaves in 1860, according to the 1860 U.S. Slave Schedules (on Ancestry.com; subscription required), including two girls, ages 10 and 11, who would have been old enough to be your John Henry Holliday’s mother by 1870. Henry B. Holliday also owned one 18-year-old mulatto woman in 1850, so you know that the family owned slaves over the course of John Henry “Doc” Holliday’s life. 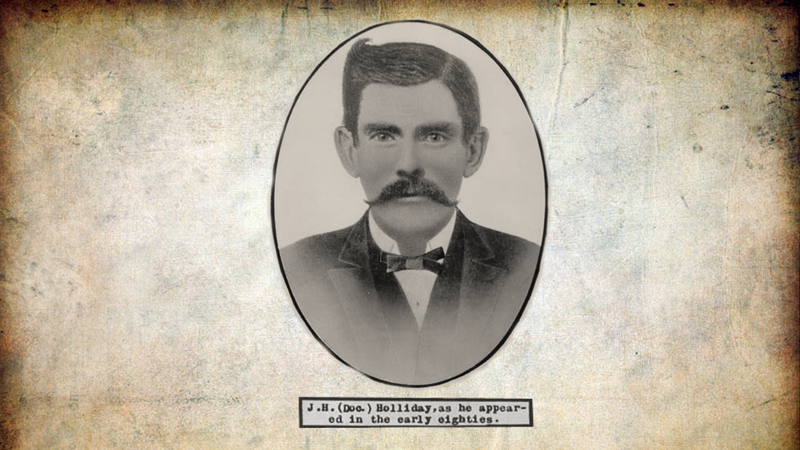 If he did father your ancestor John Henry Holliday, you may want to consider the possibility that one of the individuals in the household of Doc Holliday’s father was the mother. Before you make that leap in reasoning, however, you will want to trace your known ancestors back to see if this claim is even likely. You know that your great-grandfather John Henry Holliday was born about 1870 and he married Rebecca Riles and resided in Pelham, Ga. The earliest record in which we find him in this marriage is in 1900, when he and Rebecca were residing in Pelham, Ga., when they already had six children in their household. The family was residing in Bells, Decatur, Ga., in 1910, and in 1920 they were back in Pelham, Mitchell County, Ga.
Searching for records of all their children may help you learn more about John Holliday’s origins. For example, a death record for Otis Holliday, born in 1895 in Pelham, Ga., records his father, John Holliday, as being from Lee County, Ga., and his mother, Rebecca Ryles, being from nearby Mitchell County, Ga. With this information, you will want to focus your search on the southwest part of the state. A marriage of John Haliday and Emaline R. Ryals was recorded on Nov. 15, 1888, in Mitchell County, Ga., and based on the ages of the couple’s children in 1900, it seems likely that this is a record for your great-grandfather John Henry Holliday. Focusing our search in Mitchell County, we located a 7-year-old Rebecca Ryals recorded in the household of her parents, Henry Ryals and Henrietta Ryals, in Mitchell County, Ga., in 1880, which matches the birth date for Rebecca (Riles/Ryles) Holliday in other records and would mean that she was about 15 years old when she and John married. Her father, Henry, was residing in Decatur, Ga., in 1870 in the household of Jacob and Eveline Williams. This is a county where your John Henry Holliday resided in 1910. In 1880, there was a John Holliday, age 9, residing in the household of Wilson Holliday and Louisa Holliday in Marietta, Cobb, Ga. This could very well be your John Henry Holliday. Although the location in Cobb County is completely across the state from Mitchell County, where he married and lived with Rebecca Riles eight years later, it is closer to Spalding and Fulton counties, where you know the family of Doc Holliday resided. It is always handy to refer to county maps to see if the records you are locating in various parts of the state make sense for where you know your ancestors were located. There are two other good matches for your John Henry Holliday that are worth exploring further. One is the John Holliday recorded in 1880 in the household of Jerry and Mary Holliday in Baker County, Ga., which shares a border with Mitchell County. Ten years earlier, Jerry and Mary Holida were residing in Baker County in 1870 with a 1-year-old son named John in their household, so you know the family was in this area for a while. Another John Holliday, born the same year, was recorded in 1870 in the household of Emery and Kate Holliday in Dougherty County, Ga., which is in between Lee County (where the death record for Otis Holliday says that John Holliday was born) and Mitchell County. John was not in the household in 18880, when Emery and Kate were still residing in Dougherty County, and considering that he would still have been a minor in 1880, it is possible that he was deceased by this date (and therefore not your great-grandfather) or was living with other relatives or an employer. Because both families are in the right area and had sons named John the same age as your John Henry Holliday, we encourage you to investigate both further to see if you can prove that one is your great-grandfather. Based on what we could locate, we did not find any evidence to suggest that John Henry “Doc” Holliday was the father of your John Henry Holliday. It seems a good possibility that your ancestor belongs to one of the Holliday families we identified living around Mitchell County, Ga., where we know your great-grandfather settled and raised children. Your best option moving forward would be to research any potential siblings of your own ancestor for more information on the origins of your Holliday family, as well as to trace the Rebecca Riles family, too. This answer was provided in consultation with Lindsay Fulton, director of research services for the New England Historic Genealogical Society. Founded in 1845, NEHGS is the country’s leading nonprofit resource for family history research. Its website, AmericanAncestors.org, contains more than 1 billion searchable records for research in New England, New York and beyond. With the leading experts in the field, NEHGS staff can provide assistance and guidance for questions in most research areas. They can also be hired to conduct research on your family. Learn more today about researching African-American roots.